If you’ve been on the Internet of late, you have probably noticed social media has been awash with photos of muted pastel colour tones. There’s been an over saturation of perfectly preened manicures in ice blues, luscious locks in pastel lavender, statement walls in cold greys and luxurious bedrooms in soft baby pinks. This colour palette has been referred to as the ‘millennial colour palette’. But why has it been named after a generation? It’s thought to have started when Apple released their Rose Gold iPhone 6 in 2015. This release was seen as one of many colour changes that indicate a shift in so-called ‘gendered colour norms’ and cultural tastes. Theorists suggest that this also points towards a broader change in the way we think about colour, branding, and gender. Where do Colour Trends come from? Traditionally, they come from the textile and fashion world, from the colour matching corporation, Pantone. 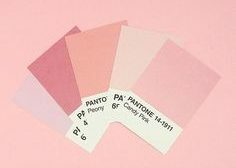 With their universally used colour matching system that features standardised numerical IDs that identify specific hues and tones, Pantone’s colour system has become a world authority and a pop icon for the world. Pantone is responsible for Coca Cola’s iconic red (Pantone 484), the allusive Starbucks green (Pantone 3298) and so much more. 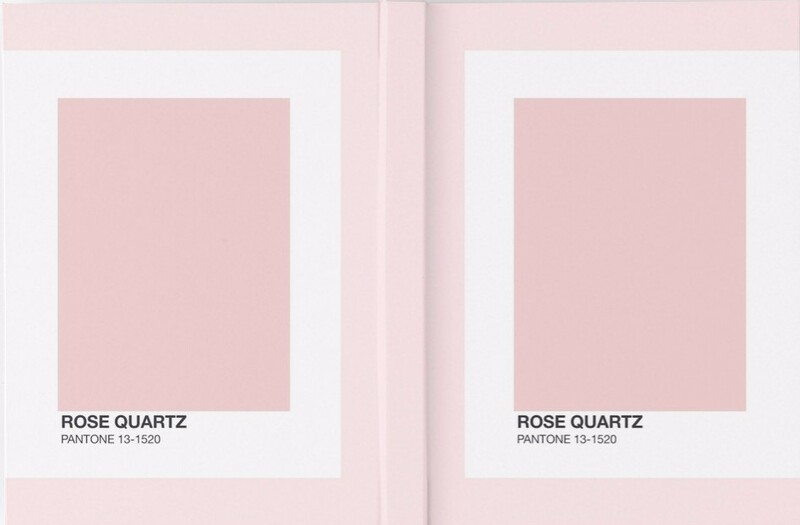 Pantone is at the helm of the colour industry, therefore influencing art, interior design, fashion and so much more. It’s bizarre to think that colour trends have such impact on the style of kitchen cupboard door we have, and the colour of the bedding we choose. How are Colour Trends Chosen? 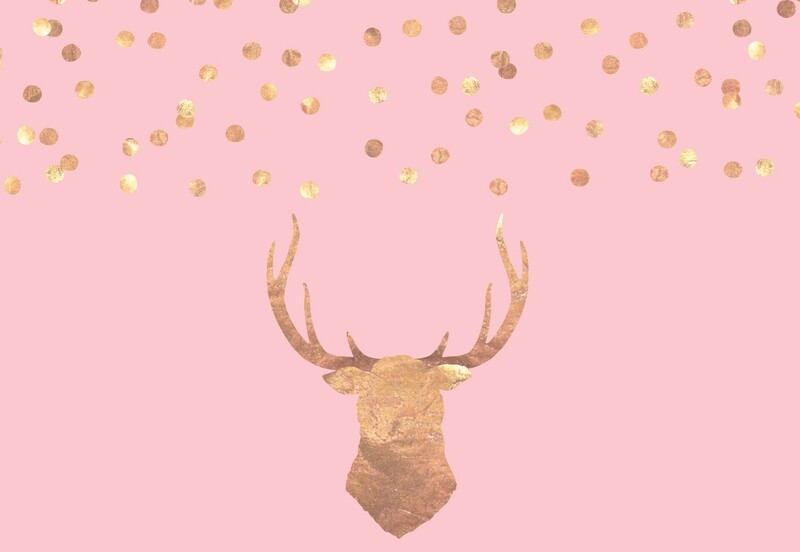 The way a colour trend is decided is really simple; a classified group of colour decision makers meet twice a year and determine which colours are “in” for the season, the colour of the year and then choose the top ten. While other trends have more organic routes, it is fair to say they are much less impactful. Technology has allowed us to experiment with colour, and see the way it transforms a space. A small bedroom can look much bigger with the right tones. Fresh greys and purples can completely modify the way an old kitchen looks, giving those living their confidence and relaxation. These colours can also be used to repurpose old furniture, giving your home a facelift. This gorgeous deep blue and pink living room looks incredibly calm and collected. 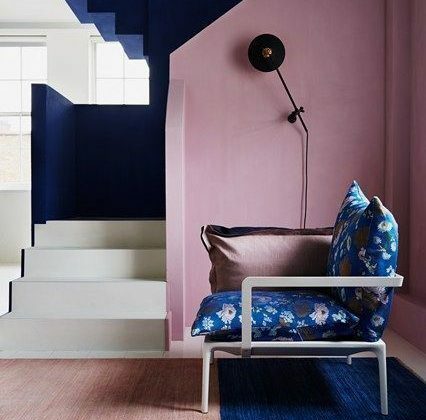 We love the clash of the white staircase with the dark blue. The simple metal frame of the chair blends in really well with the pink. If you want something similar then check out our beautiful deep purple and cream Bella Venice Bedroom, giving severe bedroom envy and goals. We’re under no illusion that making a bathroom look stylish is a challenge. After all, it is where we go to make our dirty selves clean. 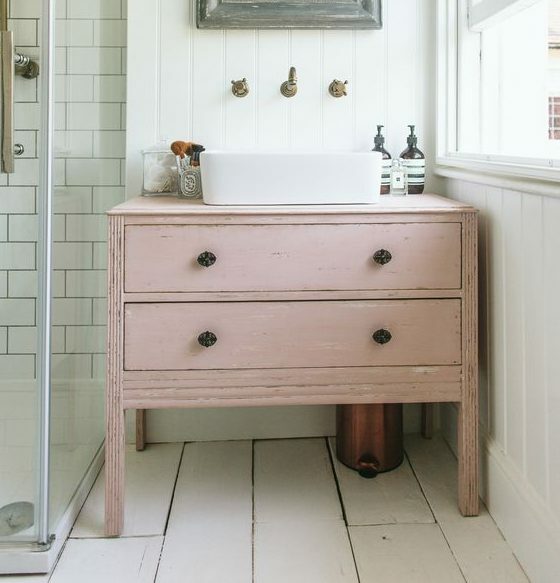 This re-purposed pink cabinet looks amazing with the chrome taps, bin and drawer handles. The worn white floor board adds a relaxed and rustic vibe that we’re really into. If you want something similar then check out our traditional chrome drawer handles. 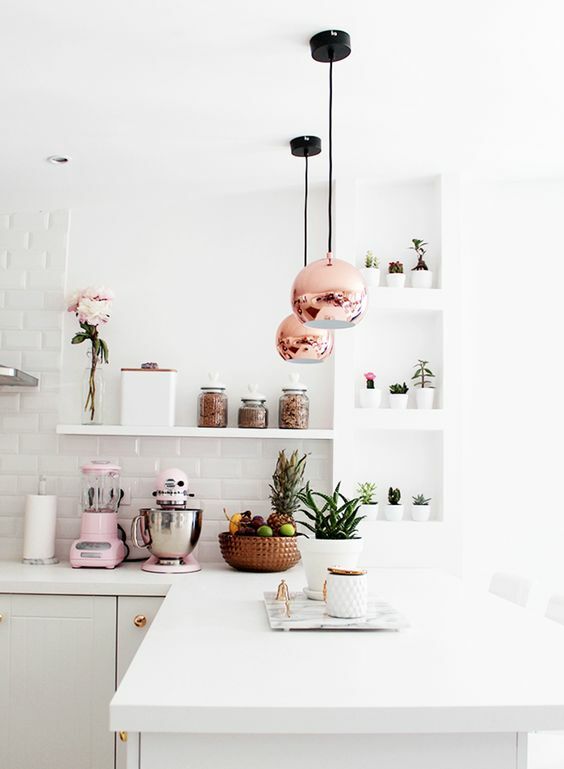 We’ve got severe kitchen envy here – this white kitchen with pastel pink and rose gold finish looks amazing. The shelving with flowers, plant life and really simplistic colour scheme is the thing of dreams. Check out our kitchen accessories – we’re sure to have a few things that will inspire!